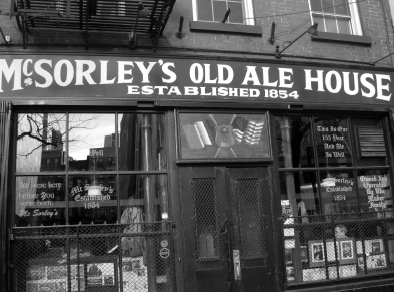 Is Houdini’s Ghost Haunting McSorley’s Old Ale House? L’Aura Hladik, author of Ghosthunting New York City, investigates McSorley’s Old Ale House. Does Houdini’s ghost create mayhem at the bar? John McSorley arrived in New York City from Liverpool in 1851 on the ship Colonist. In 1854 he opened a saloon at 15 East Seventh Street, naming it The Old House at Home. It was a place for Irish immigrant workingmen to feel at home while enjoying a beer with some cheese and crackers. By 1908 a storm had ripped the original sign down, and it was replaced with a new sign bearing a new name: McSorley’s Old Time Ale House. Later on, the word Time was removed from the name, and to this day the establishment is called McSorley’s Old Ale House. In 1910, at the age of 83, John McSorley died in his apartment above the bar. His son Bill took over the business. By 1936, two years before his death, Bill sold the bar to its first non-McSorley owner, Daniel O’Connell. Only a year later, in 1939, O’Connell died, leaving the bar to his daughter, Dorothy O’Connell Kirwan. Dorothy promised her father she would not allow women in the bar, and she kept that promise. She appointed her husband, Harry Kirwan, as the manager. Dorothy entered the bar only on Sundays, after closing time. Eventually, ownership was passed along to the Kirwans’ son, Danny. The next owner of McSorley’s was Matthew Maher. He and Harry Kirwin had met by chance when Harry was visiting Ireland in 1964. Harry’s car broke down, and along came Matthew Maher to save the day. In return, Harry promised Maher a job if he ever came to New York City. Later that year, Matthew Maher began his employment at McSorley’s as a waiter and bartender. Maher was promoted to night manager of the bar, and in 1977 he purchased the bar from Danny Kirwan. My mother and I visited McSorley’s Ale House in January 2010. The bar is within walking distance of Cooper University, which I am sure the students there greatly appreciate. The swinging wooden doors with their oval windows are worn along the edges from 156 years of use. Sawdust is strewn over the floor, and a coal-burning potbellied stove keeps the place warm and inviting. Mark chimed in that a friend of his who once rented the apartment above the bar would occasionally hear tables and chairs moving, as well as distant voices, long after the bar was closed for the night. Pepe was kind enough to bring owner Matthew Maher down to the bar so I could interview him. Although Matthew has been living and working in New York City since 1964, he’s maintained a sweet Irish brogue. I asked him, “Have you had any ghostly experiences while working here?” and he chuckled and said, “Have ya got a year to spare?” Well, that certainly got my attention. Maher told me that McSorley’s is famous for always having at least one feline “on staff” at the bar. One night after closing, Maher was cleaning the kitchen. He returned to the bar area and saw the cat at the end of the bar purring and nuzzling up against an unseen hand that was petting it. According to Dr. Philip Ernest Schoenberg, tour guide for Ghosts of New York, whenever a cat is seen in the window of McSorley’s, Harry Houdini is present as the spirit inside the cat. Why Houdini, you ask? Dr. Schoenberg claims that the set of handcuffs secured to the footrail of the bar once belonged to Houdini. Maher also pointed out the print depicting McSorley’s that hangs behind the bar. He said that when a local artist presented the print to him, Maher immediately commented, “Very nice! You even included one of the McSorley’s cats.” The artist, appearing confused, stood back and carefully examined the print. He told Maher that he never painted the cat and had no idea how it ended up in the finished print. The cat’s body is facing the entrance of McSorley’s, but its head is turned, looking over its shoulder toward the rear of the dining area. According to Ted Andrews in his book Animal Speak, cats represent mystery, magic, independence, and nighttime. In ancient Egypt, the cat was revered and usually represented the goddess Bast. Cats have been associated with witches as their “familiars.” In this respect, it is believed that the cat embodies the spirit of a former witch who crossed the line and did something worthy of punishment. That punishment is to incarnate as a cat and serve the needs of another witch for nine lives before being allowed to incarnate once more as a human. 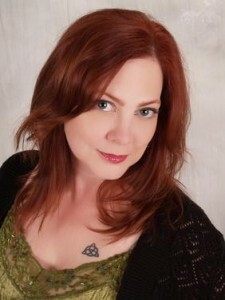 It’s interesting to note that cats are typically feminine in their energies and connections. 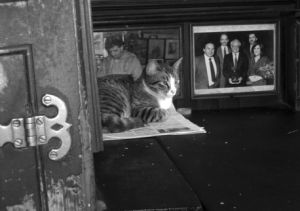 McSorley’s did not allow women in the bar until 1970, yet the cats have been present all along. Brian pointed out to me a dust-covered gas lamp that hangs in McSorley’s. On it are several turkey wishbones, also covered with dust. McSorley’s tradition calls for a soldier leaving for war to place a wishbone on the lamp, then remove it when he returns. Brian thinks this tradition started with World War I; other sources claim it started with the Civil War. Other than a soldier leaving or reclaiming his wishbone, no one is allowed to touch the gas lamp, not even to clean it. Brian said that the dusty wishbones still on the lamp serve as a memorial of sorts for the soldiers who placed them there before leaving for war and never returned. I doubt Houdini is hanging around McSorley’s as a cat. However, the disembodied noises, the unseen admirer seen petting the cat on the bar, and the lengthy history of notable guests at the establishment certainly lend credence to assertions that the place is haunted. Personally, I did not capture any evidence of paranormal happenings. Rather, my mother and I were captured by the mouthwatering aroma of the burgers that landed on the table by the front window for a young couple having lunch. The motto of McSorley’s is “Be Good or Be Gone.” Apparently, someone is being good for an indefinite amount of time, as they’re not yet gone. Keep this in mind if you visit McSorley’s, and order an extra round of “light & dark” beer when you belly up to the bar.